Staff turnover is painful for every company. The executives have to compensate for costs reaching as much as 213% of the lost employee's annual salary. New employees have to be satisfied with onboarding, or else they'll keep looking. Even the teams have to adapt to working with new people. No one leaves the process unharmed. However, there's one simple way to make turnover less painful: employee retention. Even if you think it's easier said than done, we'll dispel the myths and give you the answer to the burning question: how? In this blog, you'll learn how three very successful companies retain their employees. From psychological tricks to strategies, here's what you can do to make turnover less painful at your company. If your company is among the 50% of organizations that struggle with retaining their employees, know that it's not enough to just shower them with benefits. Instead, you should understand what motivates your employees to stop over 70% of them migrating to a different company just because they want to advance their careers. And that's what Ericsson does. This communications giant successfully retains 93 out of 100 employees. They invest in understanding every division's staff, and their unique needs. The first thing they do is get feedback. For the past four years, the HR team at Ericsson has sent out Dialog: an annual survey to all of their employees to gauge the level of employee engagement. Gordana Kovacevic, the president of the Croatian subsidiary, claims that this helped them understand what good conditions mean for their company. And since no two teams are alike, Ericsson use the Dialog survey to apply the grassroots learnings to their policies and practices. In addition to implementing the findings, Ericsson us the Career and Competence model to support their employees' ambition. This mapping tool allows employees to visualize their progress within the company, as well as understand the advancement opportunities they have. They can see how mature they are, what they need for the next promotion, and what options of migrating to different departments they have. It's a very transparent way of providing the staff with the exact blueprint they need to follow to succeed. Ericsson definitely attract the top talent in the industry. That's why their policies allow for enough flexibility to satisfy every employee's needs. They offer part-time, flexible and working from home arrangements to their staff. In practice, this has significantly improved employee efficiency and their job satisfaction rate. And while Ericsson has many international divisions, they're staying agile and listening to each employee in order to create the best policies for each. One size does not fit all, and the HR team at Ericsson makes sure that this knowledge is reflected in how they address employee retention. Replacing a highly-trained employee can cost more than 200% of their annual salary so Parkview Health, an organization that composes of over 11 hospitals across Ohio and Indiana, knew they had to change their approach to turnover. And rather than to go in blind, they first set out to understand what made their employees leave. In collaboration with the Work Institute, they interviewed the employees who recently left the organization in depth. The most shocking conclusion was that the pay wasn't why employees left. It turned out that the employees wanted a better work-life balance and more realistic job expectations. Additionally, Parkview realized that onboarding and other aspects of organization needed to be improved. Immediately, the leaders asked employees to help them redesign the onboarding process. They used focus groups to create the new 3-stage onboarding process that would make job expectations clearer. In the last stage of the process, new hires were even assigned mentors to help them. Parkview also created a bigger recruitment pool. They added referral programs, peer reviews, and even incentives like welcome bonuses to improve how they hired and retained staff. Finally, the biggest retention problem for Parkview was the first-year nursing turnover. They reduced it by creating a career path program and tuition assistance programs. They even reduced the nurse-to-patient ratio to 1:4. They learned from the employees who left, as well as the employees who stayed. Together, they created strategies which reduced the turnover by 36% and increased job satisfaction. Not a lot of organizations have tried the same things Netflix has when it comes to employee retention. While they don't have a robust HR system, they know how to motivate their employees with a few motivation-boosting "tricks". The first they do is put their culture first. Netflix's employees are the evangelists of the culture and the platform. For example, the company shows how much they trust their employees when relaying their code of conduct. For your company, the code of conduct may include thousands of words to make sure the guidelines are clear enough. 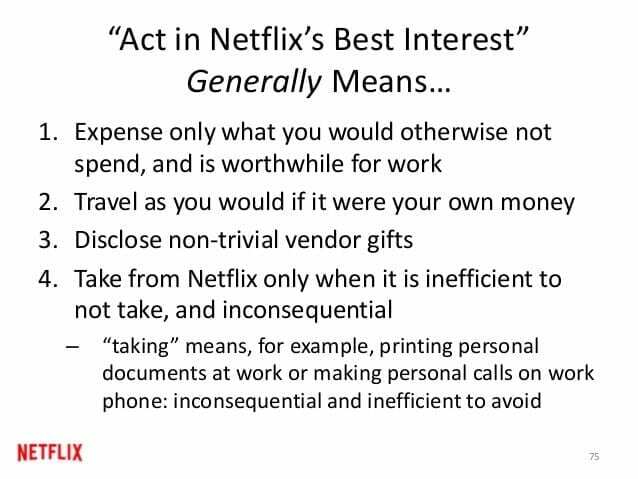 For Netflix, it's a single line: "Act in Netflix's best interests". "Travel as you would if it were your own money," and "Take from Netflix only when it is inefficient to not take, and inconsequential." It sounds a bit like the 10 Commandments, right? The second thing Netflix does is hire a certain percentage of the top talent they like to call "A players". They motivate the rest of the employees. When you work alongside some of the best experts in the industry, you automatically want to do better. After all, in Netflix's head of HR's own words: "Excellent colleagues trump everything else". Finally, Netflix may be quirky, but their teamwork first retention approach is definitely a winner. They hire managers who encourage collaboration and listen to their employees' feedback. Every company has its own approach to retention which stems from the company culture. However, the most important thing is listening to what your employees need. A competitive salary can go far, but innovative practices that show you value your employees go even farther.